Today is the second day of sneak peeks for The Ton’s September Release! All new products (stamps, dies and couture mixes) will be available in the shop on Monday, September 6 at 7am (EST). We have a couple of nice incentives for you for this holiday release: if you spend over $75, Effie will include the new Hazelnut Kisses Couture Mix. If you spend over $100, Effie will include our 2×3 Layered Christmas Poinsettia mini stamp into your order as a free gift with your purchase. The incentive stamp will be included in your order until supplies last. This does not apply to prior purchases. Today, we are focusing on some beautiful new sets: Folk Art Florals background, Plus One, Born Classy, City Girls: Retail Therapy, Scenes: Grand Stairway, and Scenes: Department Store. Let’s get started! For my first project, I wanted to really showcase how stunning the “date” is for the pretty girls in our lineup. There are not one, but TWO men included in Plus One, and they’re both so handsome! Effie has included several different stylish accessories and accoutrements. For my first project with this handsome devil, I decided to model him after my own handsome devil… My hubby is one of the most handsome redheads I’ve seen, and so I had to make him an anniversary card with his likeness on the front, because really, who wouldn’t like to see themselves on a card? To start, I heat embossed this dapper dude onto some watercolor paper with platinum embossing powder. I used various shades of blue and gray to color his suit and tie, then added some Spectrum Noir shimmer to the tie to really make it pop and add some texture, as well as covering his shoes with Glossy Accents. His hair… well, that was a challenge. Orange was too orange, adding red made it almost neon, so adding some brown to just the edges of his head, then pulling the color out with my wet paintbrush seemed to do the trick to getting that beautiful auburn hair that my hubby covers with a hat every time we leave the house (wah!). I trimmed the watercolor panel down, then added a strip of light blue foil to the far edge, then added some very masculine diagonal stripes down the side of the card base using Minor Stripes and more platinum embossing powder. My next project features two of the fantastic, chic new shopping sets debuted today: City Girls: Retail Therapy and Scenes: Department Store. These little shoppers are too cute for words! To start, I heat embossed the largest of the shoppers in the City Girls: Retail Therapy set onto watercolor paper using white pearl embossing powder. I colored her and all of her packages using my Zig markers and a wet paintbrush, focusing on a pink, black, and pale gray color scheme. (Tres chic, no?) I fussy cut her out and set her aside. For the card base, I simply stamped that fantastically detailed Scenes: Department Store onto my white top-folding card base using Crystal Pewter ink. I wanted the background to be visible, but subtle, focusing the main color on the pink and black packages our shopper is so bravely balancing. Next, I die cut a piece of pale gray card stock using the Stitched Rectangle dies for her to stand on, and to make her stand out a bit more from the busy background. I adhered the die cut rectangle, then popped her up with dimensional adhesive. The last step was to add the greeting, also from City Girls, stamped in Pink Derby ink. (I’m really loving that color! Such a beautiful shade of magenta.) I stamped it on a strip of white card stock, then popped it up over her legs. Well, that’s all for me today! Be sure to check out what the rest of the team has in store for you, because there is some serious eye candy waiting for you! Don’t forget about the giveaways going on, too! Leave a comment on The Ton blog on each day of Release Week (1-4) for a chance to win one of four $25 gift codes to the shop. There are additional $10 gift code giveaways that you can also win by leaving comments on the Design Team member blogs on each day of Release Week. So there are an additional 7 gift codes up for grabs! The comment period for the Daily Release and DT Giveaways will close on Thursday, September 29 at 11:59 PM. Winners will be chosen at random and announced thereafter. See you back here tomorrow for some more fantastic product debuts and holiday projects! Have a beautiful day, friends! Emily, I drool over every single card you make. They are all stunning. Your zig skills are second to no one. Great cards! Emily, just love the cards you showcased above! Thank you for sharing your creativity! So creative, so chic, so liking your cards. Can't wait to get the guy stamps- love your card!!! I love how classy and sophisticated these cards are! Great color and design! OMG!!! Stunning cards!!! I love this new release!!! This new release is so great!! Love the cards!!! Love the pink and black. Also love that they have included a male image!! I LOVEEEEE the colors of the retail therapy card!!! The pink really pops – love that shade of pink! Awesome cards! Lovin' this release! Very diverse collection of new products , beautiful job ! Love your cards! This new release is wonderful!! Awesome cards, Emily! Your coloring is superb & the designs on these are wonderful! Love the guys hair!! Great job on all of these! 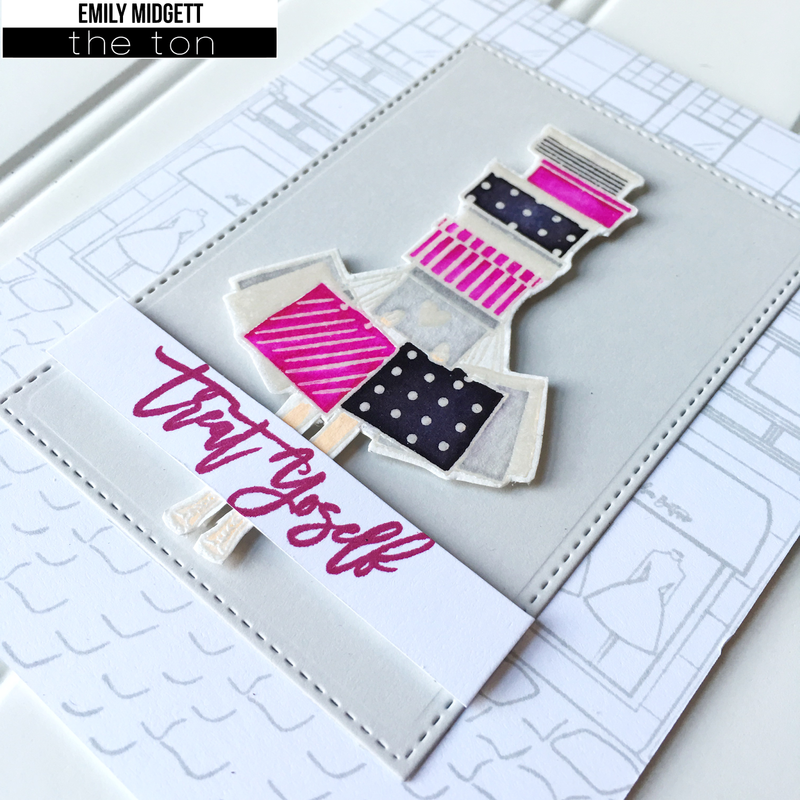 Gorgeous cards, LOVE that pink derby with black and gray! The DT is doing a great job of featuring these wonderful stamp sets. Amazing cards. You are very talented. Handsome groom. Your cards are amazing! Love the watercolor on the gorgeous man! And that's me with all the boxes shopping…lol! I love that light background. It really adds more interest to an already wonderful card! 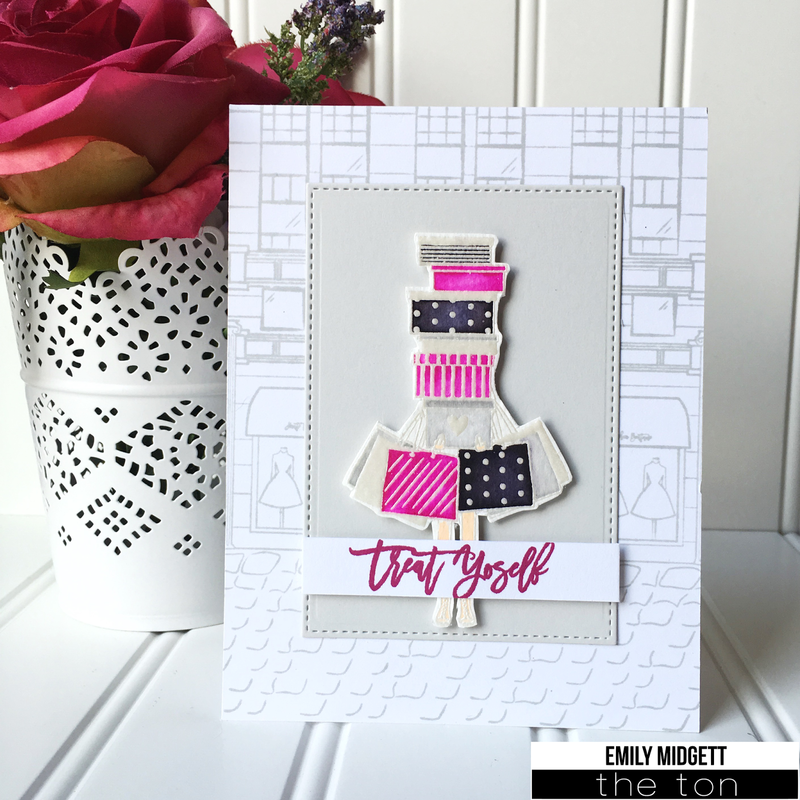 I just love your Plus One card – fabulous! Lovely cards. I really love the anniversary card … stunning. Love your cards. Great new stamps. Can"'the wait to get them! LOVE the fab smoky background on your anniversary card and I wish the Treat Yourself boxes were all full of stamps and dies from the Ton for me!! Wow you did such a great job of creating wonderful backgrounds for these fashionable images. I really like what you did with those awesome products! Awesome cards, this is a great new release. Love the way the gift bags pop off the page! Handsome dude in the first card! The second has humor in the stack of boxes blocking the shopper. Great cards! Thanks for sharing. BOTH are WONDERFUL colours and designs – I'm INSPIRED!!! Love your Anniversary watercolor and the perfect background stamping on your second card! You are so clever and I am in awe!